Originally when my boys were younger, I could barely get them to sit still long enough to make through a whole children's book let alone one page. Now that Dane is learning to read in school and learning how much he enjoys doing so, it has become a wonderful night time trend for us as a family. This time spent reading is also good for a calm down period before we get into bed. It gives Declan the chance to learn while Dane practices his reading, and we love just listening. So when Macmillan Children's Books asked me if I'd be interested in reading a few of their nighttime themed books, we were thrilled to give the boys the chance to pick their own new stories. The boys picked Power Down, Little Robot Hardcover by Anna Staniszewski and Sweet Dreams, Pout-Pout Fish (A Pout-Pout Fish Mini Adventure) Board book by Deborah Diesen. 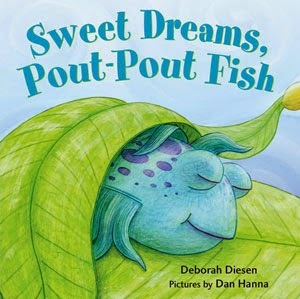 The Sweet Dreams, Pout-Pout Fish synopsis says "A short and sweet mini-adventure especially created to introduce the youngest guppies to the popular Pout-Pout Fish. Feeling sleepy? It's time for bed! Toddlers will love swimming along with the Pout-Pout Fish as he turns little frowns into sleepy smiles." This was an adorable book! It is all about a cute little night routine. Sweet Dreams Pout Pout Fish, is a good book for kids actually trying to get into a nightly routine. It is always an easy read for those just beginning to read or for those who can't to understand. Dane whipped through it fairly quickly. The Power Down, Little Robot synopsis says "It’s time to power down for the night, but Little Robot isn’t ready! He quickly opens his stalling program. Luckily, Mom Unit knows exactly how to get him into his sleep module." I'm so happy with the reader Dane is becoming as he enjoyed this one quite a bit too and easily read through it. The boys enjoyed the parental role in bedtime int his one! Recommendation: Definitely worth the money for the Sweet Dreams, Pout-Pout Fish book. 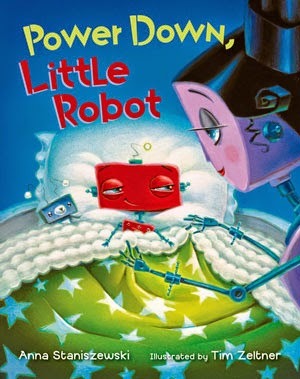 I felt the Power Down, Little Robot was a little expensive for a children's book like this one. The story lines are great in both of these books and the boys very much enjoyed them both.